We wish the weather was something within our control. I’m sure many New Englanders feel the same way while endlessly shoveling, spinning tires and just trying to get from A to B. Although we often make deliveries in snow, rain and fog; recent heavy snow accumulation has made some delivery regions hazardous for periods of time. Therefore, some customers will experience delays in order deliveries. In times like these, weather-related delays are unavoidable in some areas. However, we are doing everything in our power to get orders delivered as quickly and safely as possible. When your place your order, whether by phone or online, you are given an estimated time frame in which your fuel will arrive. However, during this record-breaking snowfall for New England, there are instances when it’s just not possible to meet these delivery windows. Slippery conditions and poorly paved roads make it not only exceedingly difficult to make deliveries – but also raises serious safety concerns. These hazards aren’t just during travel to the delivery location – there are also issues upon arrival in some areas. Our large, wide delivery trucks need enough space to safely travel down your road and park. Cars need to be able to travel around our truck and not be blocked by it. Once parked, the forklift is lowered from the truck to unload the pallet(s) to be brought up the driveway. Large snowbanks taking up space in the road can either make both of these tasks not possible, or just dangerous for other drivers on the road. Our delivery team will communicate with any affected customers to find the safest, quickest delivery time under these circumstances. After snowfall records set 37 years ago have been broken in New England…there is still more to come. We hope everyone is staying safe and informed. Are You At Risk of Running Out of Pellets? It’s late into the winter – yet the Northeast is still being relentlessly hit with heavy snow and freezing temperatures. 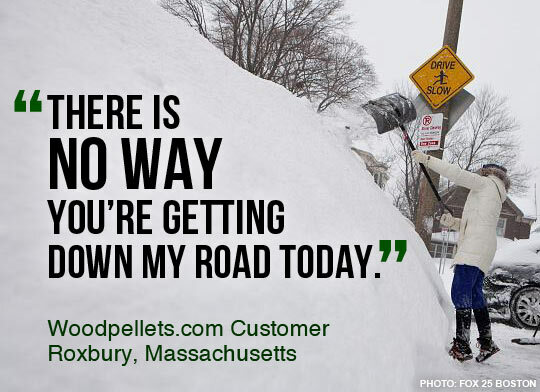 You might be starting to wonder if your pellet supply will last you through the rest of the heating season. 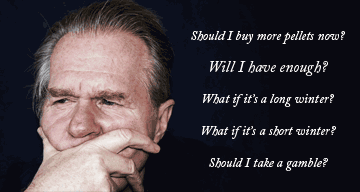 You’re not alone in this quandary. This is a tricky time of year – where a wood pellet user must decide to gamble with a low supply and risk potential supply shortages, or choose to just play it safe and top off his or her supply now. Of course no one knows for sure what will happen with the weather for the remainder of the winter. There is historical data, professional forecasters, and even a groundhog that can give a prediction – but there is no real way to know with absolute certainty. Earlier this year, we wrote about the Farmer’s Almanac weather prediction, which hasn’t been fully accurate. The Northeast prediction was a much colder than normal winter, which has been true, and “below normal snowfall”, which has not been true. Unfortunately, last winter much colder than many had anticipated…leading to a late winter shortage in many areas. With the harsh winter we have already experienced, there is certainly a possibility for more regional shortages again this year. So, are you at risk of running out of pellets? Well, there are many factors that will determine your risk. Your pellet stove model, the prominence of secondary heating sources, the type of wood pellets burned, and the area of your home you heat with pellets are just some of the many variables that affect your fuel consumption. Your home’s heating fuel cost is typically one of your largest annual expenditures. 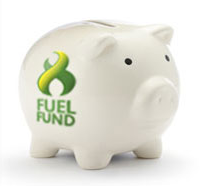 The Flex Savings Plan is a simple way to stretch your annual fuel cost out over many months – and avoid the financial stress of a large lump sum payment. The Flex Savings Plan was created to help our customers budget this large annual expense – and it’s completely free. 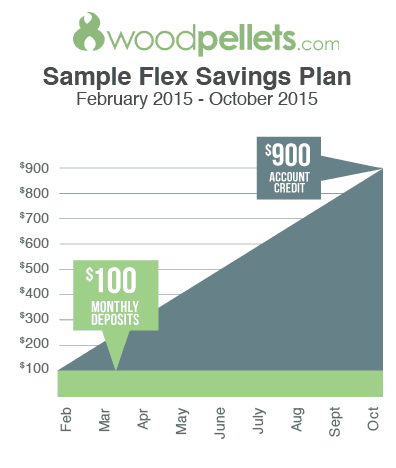 The plan works by automatically making a monthly deposit using an electronic check or credit card into your Woodpellets.com account, in any amount you are comfortable with. Each deposit is added to your account as credit to use on your next purchase. And when you are ready to order, your accumulated credit amount will be deducted from your order balance. The graph on the left shows an example of a typical Flex Savings Plan. This consumer enrolled in February and decided to deposit $100 over nine months to use towards their Fall order. Come October, this consumer will have managed to save $900 in credit towards their order! Remember, you are not placing your order when you enroll in the Flex Savings Plan; and it’s your decision how long you wish to remain enrolled. Whether you’ve deposited $100 or $1000 – you can order at any time. How much credit you want to accumulate is up to you entirely. Whenever you’re ready…we’re ready. We named this program the Flex Savings Plan for a reason…it’s flexible. Free Value Delivery* with enrollment by 3/10/17. Email payment confirmations will get sent immediately following any payment. Monthly payment amount can be adjusted at any time. Order whenever you’re ready. Your accumulated balance will be automatically applied. All orders using Flex Savings Plan credits must be paid in full at the time the order is placed; future Flex Savings Plan payments cannot be applied to an existing order. May be used for both wood pellet and wood brick orders. Enrollment is simple. Just call 1-800-PELLETS to sign up! For more information, check out the Frequently Asked Questions and the Terms and Conditions. Give our experts a call at 1-800-735-5387 if you have questions, or want to get started. We look forward to helping you save. *Deluxe and Premier delivery have a small additional charge. Free Value Delivery offer is valid after making 3 consecutive deposits of at least $25/month, on an order of 3 or more tons. **Delivery Priority subject to product availability and the discretion of our delivery coordinator. how wood pellets are made. Premium wood pellets burn so hot and so easily because of their very low moisture content. Unfortunately, these little heat powerhouses are unable to withstand direct contact with water. The time lapse video below will show exactly what happens when pellets become wet. “At some places, it was just a recorded message: ‘We have no firewood for the season.’ ” a Natick resident explained to the Boston Globe about her trouble finding firewood. Unfortunately for wood stove owners, she’s far from alone in her struggle. The Northeast is experiencing another tight supply of firewood this year, and what’s available costs up to 25% more than it did last year. report, “All nine states in the New England and the Middle Atlantic Census divisions saw at least a 50% jump from 2005 to 2012 in the number of households that rely on wood as the main heating source.” Although the demand for firewood has overloaded the supply of late – there is an alterative.